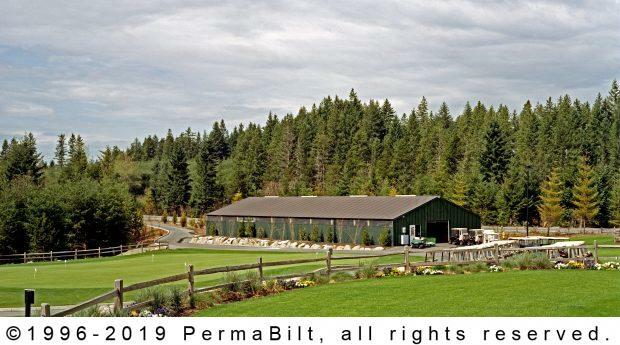 Having been in the post frame construction business since 1973, PermaBilt® has constructed thousands of commercial pole buildings. For more and more businesses, post frame has become the construction method of choice for light industrial buildings. These types of building designs and their features, along with affordable costs and safety benefits, make post frame buildings a great option. Commercial pole buildings that have been built include utility, city and school maintenance buildings, storage, studios and administrative buildings. Or a golf course equipment building that we built for the Trophy Lake Golf & Casting golf course in Port Orchard Washington. Constructed to house their golf carts and lawn equipment, the building requested was over seventy feet long. Per their specifications, the siding and roofing was 29 Gauge Grade 80 (80,000 psi) steel for great strength, durability and safety. This included 18” eave and gable overhangs. And then finally, a concrete floor was added which included fiber mesh reinforcement (for added strength and durability) and zip-strip crack-control (which reduces random cracking of the slab). In the end they were so satisfied with our work, they ordered another two buildings.